What does it take to ask students a question like this? A poker face? A bit of malice? Nitsa Movshovits-Hadar argues [pdf] that it requires only the ability to trick yourself into forgetting that you know every triangle has the same interior angle sum. “Suppose we do not know it,” she writes, which is easier said than done. This is such a delightful paper – extremely readable and eminently practical. Without knowing me, Movshovits-Hadar took several lessons that I love, but which seemed to me totally disparate, and showed me how they connect, and how to replicate them. I’m pretty sure I was grinning like an idiot the whole way through this piece. Not easy for math teachers to do! @ddmeyer I did a similar thing with my Year 9 students and the trig ratios!!! Heaps of fun and surprise! 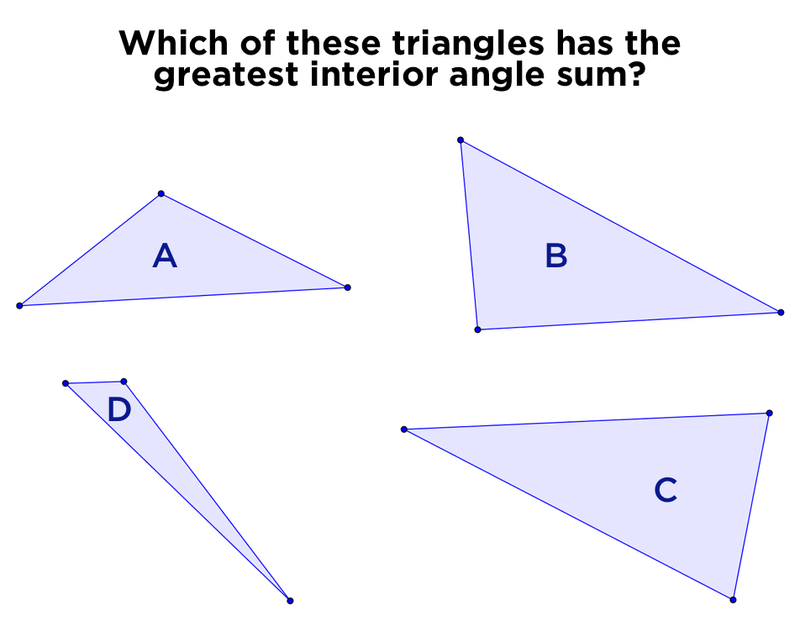 What if you asked two questions: which triangle has the longest perimeter and which triangle has the largest angle sum? It might clarify what can change in a triangle and what cannot. Also it hides the surprise better. If you teach via surprise consistently, kids start looking for the punchline. Once the whole class is convinced they can’t you can get at why and then writing a rule for it. There is nothing an 8 year old likes better than proving the teacher wrong. Theorems and formulae in textbooks should be marked with a “spoiler alert”. This is the same thing I tried to do in physics: have students learn by inquiry. Having them do multiple experiments to discover (perhaps to their surprise) that there is something conserved in collisions (let’s call it momentum) is so much more effective than just telling them. I love the idea that students can do this in math classes as well as in science classes! Having them do multiple experiments to discover (perhaps to their surprise) that there is something conserved in collisions (let’s call it momentum) is so much more effective than just telling them. I’m curious about the nature of those experiments. I’ve convinced myself that there’s a difference between Movshovits-Hadar asking her students to “measure the interior angle sum of all the triangles” and asking them to “predict which has the greatest angle sum” followed by measuring the sum for verification followed by trying to draw a triangle with a sum that isn’t 180°. What I’m saying is teachers may interpret your mandate “to discover” a number of different ways – some more productive than others. Those differences intrigue me! Thanks for sharing the article. It seems to me that the common thread in all of this was that the students were doing something. They were measuring angles or solving quadratics. When we rob them of the chance to explore and mess around with math they will never be surprised by the amazing things that are out there. They won’t have the background knowledge needed to see why they should be surprised. @Jo, really fun examples. Added to the post. Dan, if I understand what you’re describing, the analogue in science education is “asking students to predict the outcome of an experiment or demonstration before doing it” as opposed to “watching the demonstration and then explaining what happened”. It’s well accepted that requiring students to commit to a prediction before making an observation is a more effective way of achieving conceptual change. I wonder, though, if that is more applicable to science than math, simply because people have intricate mental models for how the world works, based on experience, that are not always correct: things fall when you let go of them, big things are heavier than small things, moving objects naturally come to rest. Do people come to math classes with the same level and complexity of pre-conceptions? Building from Kent Haines comment, ask students to compare the area, perimeter and sum of interior angles of a group of triangles. 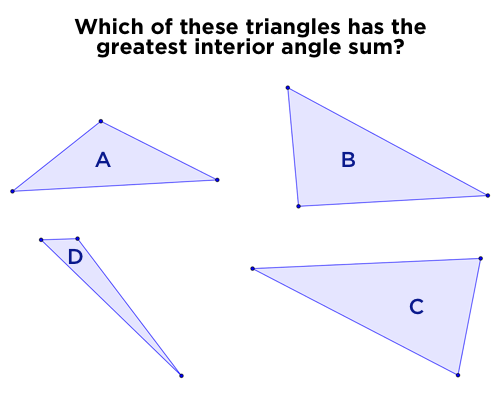 Maybe include a pair of triangles with same perimeter, a pair with same area, and a “pair” with same interior angle sum. Maybe ask them to find the angles with same perimeter, same area and same angle sum. @Jo, what do you mean by “draw me a 2-sided quadrilateral”? I’m having trouble understanding how that would provoke productive effort. If you asked me that question, I’d just scrunch up my face and look at you funny. I wonder, though, if that is more applicable to science than math, simply because people have intricate mental models for how the world works, based on experience, that are not always correct. Thanks for clarifying, Kevin. I just wanted to jump in on this and mention that people have lots of incorrect or naive mental models about mathematics that we can exploit in similar ways. Multiplication always makes things larger, for instance! I’m always happy to see math and science pedagogy rhyming with each other. I ran into trouble last year with a Geometry class that was NOT having it when I asked them to let go of what they know and prove the 180 thing. They were really upset. Some were upset because THIS IS SO OBVIOUS WE ALL KNOW THIS. Others were upset for an entirely different reason: THIS IS ARBITRARY IT COULD BE ANYTHING LIKE 359 OR 361. This gave me an out from the tricky “use your imagination” technique. It also helped me realize that “are we forced to say ____” is helpful language for developing proof ideas in my classes. Thanks for sharing the article, and even more for sharing your own experience of enjoying it. Grinning like an idiot is one of the most powerful tools in a teacher’s toolbox. This idea can be related to the educational version of the biological recapitulation theory – “ontogeny recapitulates phylogeny”. While the original biological theory is outdated and largely discredited (and like many of the biological theories of its time was subject to ethnocentric abuse), I think the concept still holds as a guiding pedagogical principle. When students follow the footsteps of the founding fathers and mothers of human thought along the discovery trail, they can truly experience the magic and meaning of the end results and get to own them. When we hand down the bottom line to our students, we rob them of what makes math worth learning. Feeling pretty thick right now. Can you elaborate what you’re doing here and why you’re doing it? Can you elaborate what you’re doing here and why you’re doing it? I took the central question of this post to be, how do you make familiar results feel unfamiliar? There is a built in surprise, but sometimes the result is so familiar that we need to make the result unfamiliar to ourselves in order to be surprised with fresh eyes. One possibility is to consciously try to “forget” the result. Hide the sort-of-familiar invariant amidst some variants. Use your imagination. Imagine you were trying to convince a skeptic. How would you convince a 4th Grader, or a Geometry-ignorant alien? These are all attempts to defamiliarize the result. I was suggesting that a way to access the surprise is to focus on the relationship of various results to each other, rather than on the results themselves. We all know that triangle angles add up to 180. But some things in math are forced to be true, and others have wiggle room. True, the angles of a triangle add up to 180. Could they have been something else? Suppose we know a full spin is 360. Is this enough to force us to say that the triangle’s angles add up to 180? What if we know that a pentagon’s angles add up to 540? Or if we know that a straight line is 180, does that force us to say that a triangle’s angles add up to 180? Even familiar results can have surprising relationships to other results. When I’m trying to rediscover the surprise, I often shift to these relationships rather than trying to ask my students to “forget” the result. @Kevin Hall–This would be the beginning of a discussion of what polygons are and aren’t with first and second graders. They have some visual knowledge of shapes but the don’t have any kind of working definition or any rules. We usually look at examples and non-examples of polygons and they realize that they have to include that polygons are closed in their definition. Then I ask them if there are any rules about how many sides a polygon has to have and their first response is usually that it doesn’t matter. That’s when, “ok, draw me a 2 sided polygon” comes in. It’s really fun to watch as, one after the other, they realize that they can’t close a 2-sided thing. This really is also an introduction to the idea that there are rules that apply to math that can be generalized. Still, even after all these years, I am surprised that raising a number to the zeroth power is one, not zero. I have to reprove it to myself like every three months. Students too are continually perplexed by that and provide a potential opportunity for violating expectations. Your GPS Is Making You Dumber, and What That Means for Teaching	What Do You Do on the First Day of School?